The Planning Board Draft Plan is available. Click here! The Public Hearing transcript is available below. Click here! Contact the team to keep up with the latest updates. This Minor Master Plan Amendment looks at ways to realize the many public benefits of an alternative design for the Bethesda Purple Line Station that the Maryland Transit Administration (MTA) is developing. On February 11, 2014, the County Council approved the Plan Amendment. For more information, see the County Council website under "Agendas & Packets." The Planning Board is scheduled to adopt the approved Plan Amendment on Thursday, February 20, 2014. The full Planning Commission is scheduled to adopt the Plan Amendment on March 19, 2014. The final Approved and Adopted Plan Amendment document will be available after adoption by the full Planning Commission. Also after adoption, the Planning Board will file a Sectional Map Amendment with the County Council to change the zoning maps to reflect the new zones. The Minor Master Plan Amendment focuses on the immediate area around the planned Purple Line station, and includes nearby Elm Street Park. Download the map (pdf, 200KB). The new designs are still being refined, but see the latest below! The 1994 Bethesda CBD Sector Plan recommended that the CCT have both a street-level route and a tunnel route to cross Wisconsin Avenue. The 2010 Purple Line Functional Plan recommended that the trail be located above the train in the tunnel route. Further study by MTA revealed that both the train and the trail could not be accommodated within the existing tunnel without significant unanticipated additional cost and posing a potential structural hazard to the buildings above. As a result, the County Council determined that the CCT would not have a tunnel route and would be limited to the street-level route. The redevelopment of the Apex building site provides a new opportunity to create a dedicated CCT tunnel under Wisconsin Avenue. On December 5, 2013, the Planning Board approved the Planning Board Draft Plan Amendment(pdf, 8.2 MB). The plan was sent to the County Executive and County Council for review. For information on the Planning Board worksessions that preceded approval of the plan, click here. Staff held two worksessions with the Planning Board, on December 5, 2013, and November 21, 2013, to discuss the testimony received at the November 7, 2013, Public Hearing. See the transcript of the November 7, 2013, Public Hearing below. The Planning Board approved the Staff Draft Plan as the Public Hearing Draft Plan on September 26, 2013, and set the Public Hearing for November 7, 2013. See the Public Hearing Draft Plan below. What about the Bethesda CBD Plan? 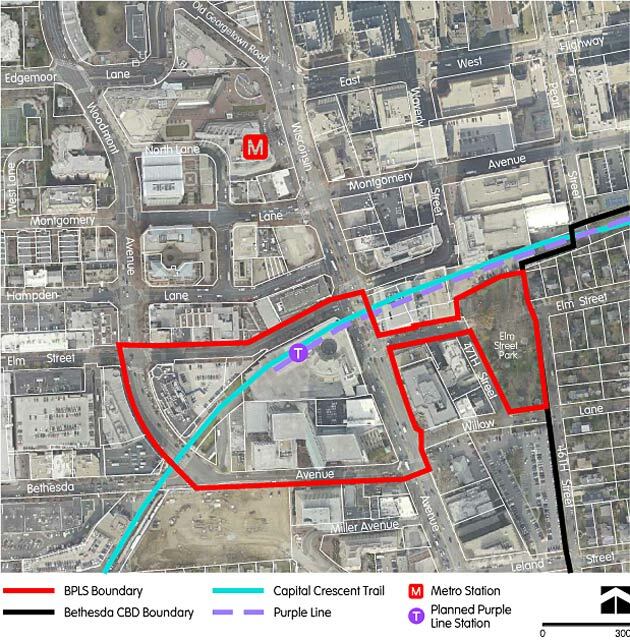 This Minor Master Plan Amendment is looking at the recommendations of the 1994 Bethesda CBD Sector Plan for the area immediately around the Purple Line Station. The Planning Department is also beginning a separate update to the 1994 Plan that will look at Downtown Bethesda and address a broad range of issues. See the Bethesda Downtown Plan page. September 19, 2013 Staff Draft Minor Master Plan Amendment online. September 26, 2013 Present Staff Draft Minor Master Plan Amendment to Planning Board for approval as Public Hearing Draft.